This staff accommodation agreement is for use where an employer allows an employee to live in premises owned by the employer, so that the employee can perform his duties more effectively. 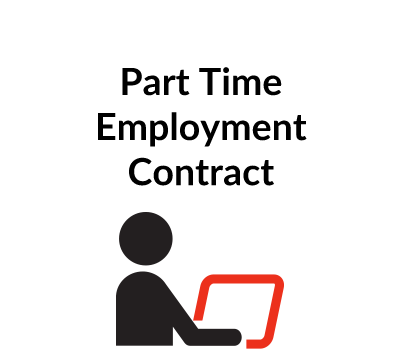 Unless terminated early, this service occupancy agreement can be terminated at any time on four weeks’ notice and, in any event, when the employee’s employment contract ends. 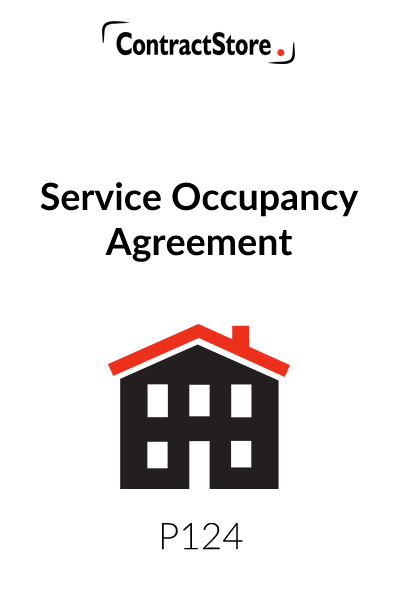 A Service Occupancy Agreement is for use where an employer requires an employee to reside in premises owned by the employer to allow the employee to perform his duties more effectively. 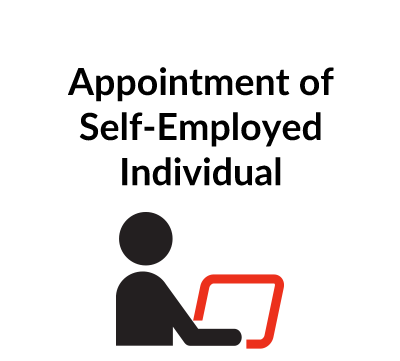 It gives the employee a personal licence to occupy the premises for the duration of his employment with the employer. The document assumes that the premises are largely self-contained and therefore no provision is made for the employer to provide any services such as utilities. It should also be noted that, where leases usually contain landlord’s covenants to repair and insure where appropriate, such obligations are generally not included in contractual licences to occupy premises. Our comments on the specific clauses are set out below. Contents: the contents are those items at the premises which are available for use by the employee. The condition of the contents should be recorded in an inventory, as the agreement provides that the employee should keep the contents in a clean and good condition. The inventory should be annexed to the agreement and initialled by the parties. 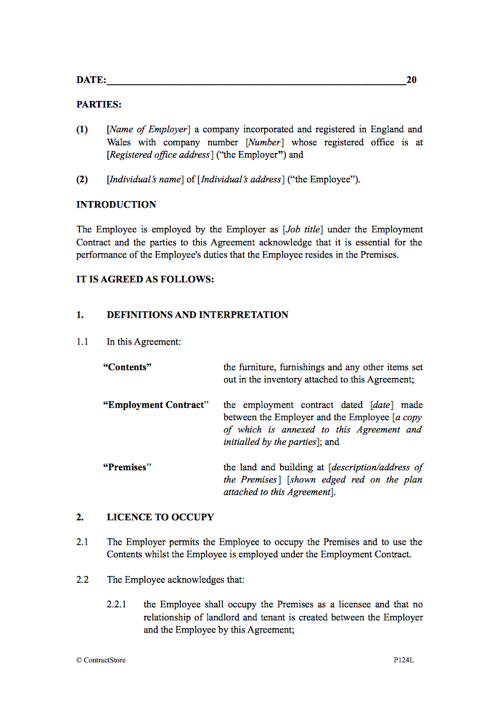 Employment Contract: Details of the employment contract should be inserted here and consider attaching a copy of the employment contract to the agreement for ease of reference. Premises: The definition of the premises will set out the land and buildings which are available for occupation by the employee. The parties may prefer to attach a plan to the agreement but, where this is not possible, care should be taken to define the premises fully and accurately. Give the full postal address of the premises and consider whether any garden, garage or other outbuildings should be expressly referred to. Clause 2.1 gives the employee a licence to occupy the premises. The acknowledgments in Clause 2.2 record the intention of the parties to create a licence and not a tenancy. You should note the difference between a licence and a tenancy. 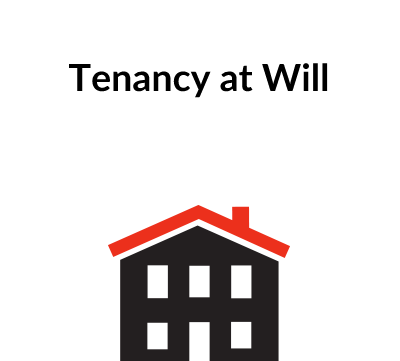 A tenancy will generally arise where the occupier is granted exclusive possession of the premises for a term at a rent. A service occupier who appears to enjoy exclusive possession is not treated as being a tenant, as the occupation and possession by the employee is treated as the occupation and possession on behalf of the employer. The employee will therefore have no interest in the premises and no statutory right to remain once the employment contract ends. This Clause deals with the obligations on the employee regarding his use and occupation of the premises. The list of restrictions may need amendment and/or addition to cater for the individual circumstances. (3) if the employer gives the employee at least four weeks’ written notice to leave the premises. The agreement has been drafted on the basis that the employer will be a company registered in England and Wales and that the employee will be an individual resident in England and Wales. A simple governing law and jurisdiction clause has been inserted here in the event that, over the length of the agreement, an entity that is registered or resident or domiciled overseas will become involved.